Recycle all that junk. All that stuff you find inside a Dwemer Ruin? Well now melt it down so you can use it to make something more valuable. All those ancient Nord swords and axes...reuse them to make a brand new shiny sword. Found some empty wine bottles? Melt them down to make glass for your new HearthFire Home. Running out of lockpicks? Soul Gem Fragment Patch for Skyrim Recycling Will not work without this mod. Added the ability to craft the Wolf Armor from the Companions Guild after you complete the "Proving Honor" quest. It can only be crafted at the Skyforge. Added Silver Arrows - Very good against the undead. Changed the formula for crafting Gold Ingots from Gold Coins and visa versa. Added the breakdown of several sets of clothing to Linen. Removed Perk requirements for ebony, dwarven, glass, Orcish, dragon, elven, Stahlrim and replaced with Advanced Armors perk only. Added ability to check to see if item is equipped (no favorite). If armor or weapon is equipped then it will not show up to be recycled. If unequiped then it will show up even if tempered or enchanted. i.e. If your wearing elven armor full set and have several pieces extra in inventory then those NOT equipped will show to be recycled. All hold guard armor sets are recyclable. Either at the Smelter or Tanning Rack. Changed the formula for Steel Plate set increased steel ingot. One Iron ingot & one Corundum ingot are used so when melted you would in theory get a steel. Now must use Magic Essence in all transmutation and organic smithing. • Tweaked the recycle amounts recieved. • A great many little additional Recycling Recipes. SkyrimRecycling.esp and download the most current verison (1.12) and replace. Added Smithing and Alchemy experience to Smelter and cooking pots respectively. Creation Kit added NavMeshing, removed it as it isn't needed. Added Silver GreatSword and Silver Sword as constructible objects and Tempering. His original mod --- > http://www.nexusmods.com/skyrim/mods/13064/? Added all of the Hold Guards equipment to the smelter list. You can now break down those shields either at the smelter or tanning rack. All Hold Guards helmets and Curiasses can now be smelted. A few other additions and tweaks. Recycle all that junk. All that stuff you find inside a Dwemer Ruin? Well now melt it down so you can use it to make something more valuable. All those ancient Nord swords and axes...reuse them to make a brand new shiny sword. Found some empty wine bottles? Melt them down to make glass for your new HearthFire Home. Running out of lock-picks? Make some. 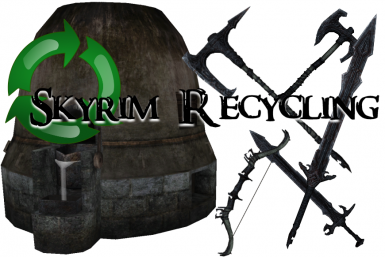 Version 1.13 of Skyrim Recycling is up, lots and lots of additions along with some actual crafting of items as well. Thank ya'll so much for the kind and constructive comments. I am so humbled and at the same time proud of our community! You folks rock! Please don't forget to endorse after downloading! Verison 1.13 - Change Log list updates. Additionally I was asked by our player community to add experience gains when using the smelter, tanning racks so I did figure that out. (REAL REAL HARD!) Sometimes the most simple mod is a Checkbox, go figure. But I was also asked if there was one without exp gains, so you now have the option under files. Pick your flavor. Recycle Items from "More Weapons Please" by Relinquishnow - Adds his awesome weapons to the Recycling list. Highly recommended mod for some beautifully crafted weapons. 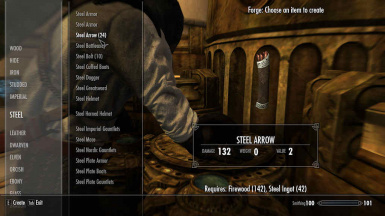 Skyrim SE Expanded Skyrim Weaponry by Lrsamways (NPC Version Only) Yes now you can breakdown these magnificent weapons (OMG) to make a freaking iron Sword. WHY! The HORROR! Have fun! 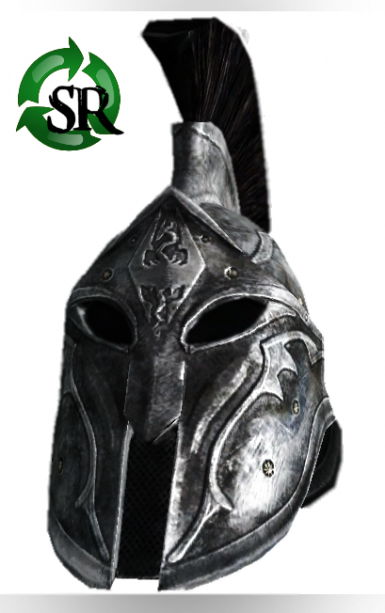 JS Armored Circlets SE by johnskyrim Download this awesome armor mod first and have some serious bling for your player character. And for the circlets you find break it down to base components with the patch. For those interested parties, this mod uses vanilla assets from the game and has only one small script. I use this mod in both Skyrim SE and Skyrim 32bit (Vanilla). So if you would like to use it on your original Skyrim it won't mess up your game but you must have all the DLC's in order to use this mod. Nearly all equipable non-enchanted armors and weapons can be smelted down to the tempering material. Roughly based on the weight of the armor or weapon, you get back about 2/3 of the weight in ingots. In addition since charcoal is base of carbon and carbon is used with iron to make steel, use the smelter to make firewood from just about any junk wood item then burn it to make charcoal. 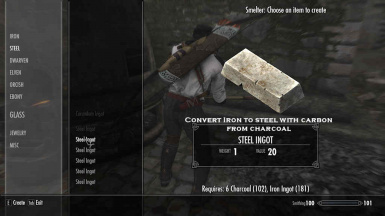 Then use the charcoal with iron ingots to make steel, allowing you to save on Corundum. In addition to the vanilla smelting of junk Dwemer metals, I added all of the bowls, urns, cogs, gears, spoons and forks you will also run across in Dwemer ruins. The bowls seem to have Dwemer metal mixed with ceramic so in theory if you heat up the bowls you will get some ash and Dwemer metal that will allow you make ingots. The same with the urns that litter those ruins. Also after you smelt that gold ore or some jewelry to get gold ingots you can craft gold coins. Those merchants can't tell the difference! I also added grouped recipes for Ore. If you have collected tens or even hundreds of ore smelting down each one is tedious so I added groups of 5, 10, 25 and 50 with the break down of 2 ores per ingot. If you have certain perks you can convert groups of some ingots to other ingots. Also for the thieves in our mists, after you steal some jewelry you can smelt it down to its base. Need lock-picks the you can craft 10 lock-picks with 1 iron ingot. And for our Mages, all those burned and destroyed books can be processed to make some paper rolls. This in turn along with a crushing some soul gems and with an existing scroll will allow you to duplicate said scroll. I included nearly all of the pelts that can be gathered from animals to be tanned into leather. Also any armor or shield that has some leather can be stripped back down to it's base as well. Shield can be broken down either at the tanning rack for firewood or smelted for its base metal. Also at the Tanning rack you can craft some torches so those dungeon crawls can be lit up. Some of the armors, shields and weapons can be broken down for alternate materials here at the Tanning Rack. I have played Skyrim for many, many hours and have collected tons of MISC items throughout my playthrough. I looked online and found several different types but none completed what I thought should be an accurate and realistic recycling of items. My thoughts go from melting down old scrap Dwemer components to Ancient Nord weapons found in crypts. So I started up my own for my playthroughs and have edited it to a point that I like. Val's Meltdown as inspiration for this mod. (Many thanks to bluedanieru for his initial creation of Craftable Torches) His original mod --- > http://www.nexusmods.com/skyrim/mods/13064/? Additional armors, weapons and junk from all of the DLC addons. PRUFEI - Protection for Recipes Using Favorite and Equipped Items once Skyrim Script Extender (SKSE) for special edition is up. Ordinator - Perks of Skyrim isn't fully compatible. The mod changes the default smithing perks which are needed for some breakdowns. Even if SR is loaded after or before. Choose the Skyrim Recycling version 1.13NP (No Perks needed) This will allow Ordiantor and SR to work together. SkyTEST - Settings - Isn't compatible even with LOOT ran. I moved both around in load order and still had lots of weird stuff. The main issue is when STS is installed it causes most items in the smelter to be under misc category. 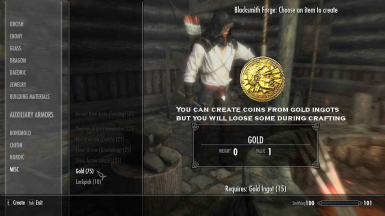 If your using Gold Ingots to Gold Coins by Tzadki3l place after SkyrimRecycling.esp if not you will get duplicate menu items to make gold coins or gold ingots from Gold Coins. 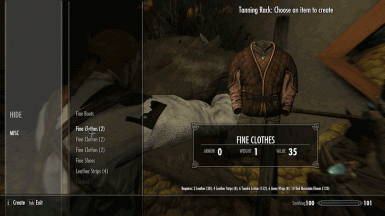 Useful Scrapping - Immersive Clutter Recycling by 0Arisaka0 will duplicate menu items at the smelter and tanning rack. 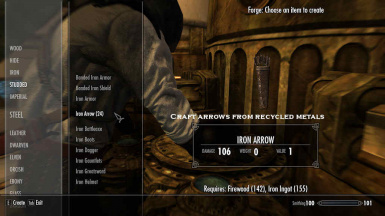 The above mods utilize the same recycling structure but implemented with different recipes. 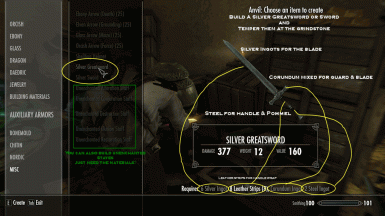 Skyrim Scroll Crafting by T9X 69 doesn't conflict per say but place after SkyrimRecycling.esp to allow its menus to run. I am sharing it now with the hopes that you may also enjoy this and add benefits to your game.